H045. 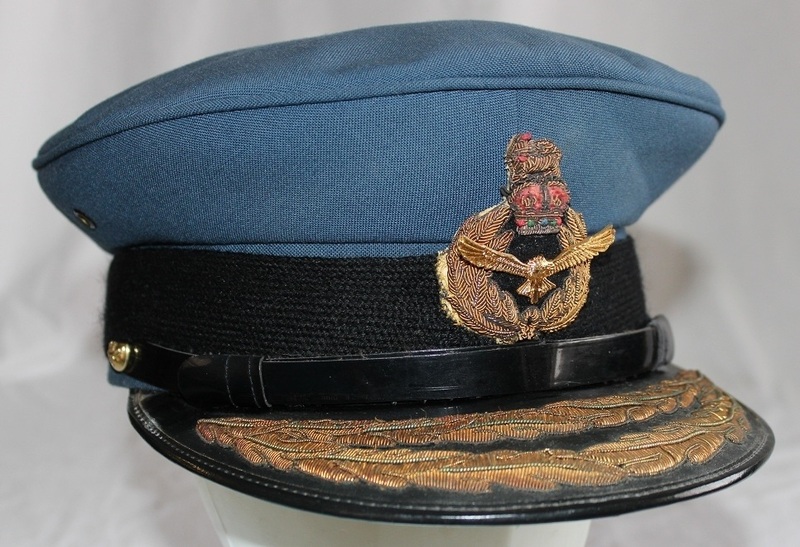 An unnamed Group Captains service dress cap with a gold bullion officers cap badge. 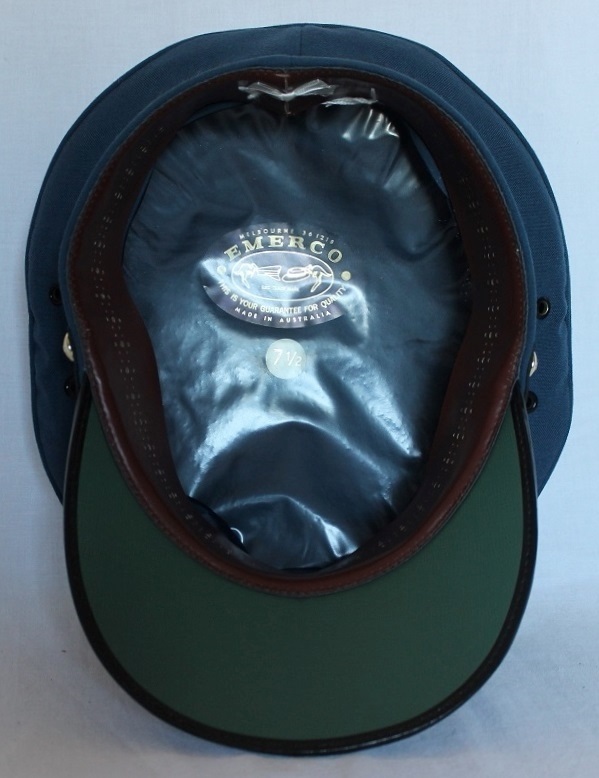 The cap is lined with a blue/grey material and is covered with thin plastic which has a label underneath stamped in gold Emerco size 7 1/2. The sweatband is foam backed vinyl, the hat band is black mohair and the vinyl chinstrap is held in place by 2 gold plastic RAAF buttons. The black peak has 1 row of gold embroidered laurel and the underside is green. H045. 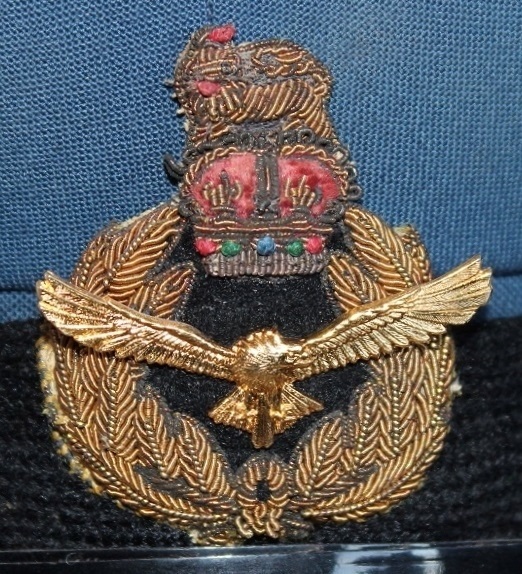 A gold bullion officer's cap badge. H058. 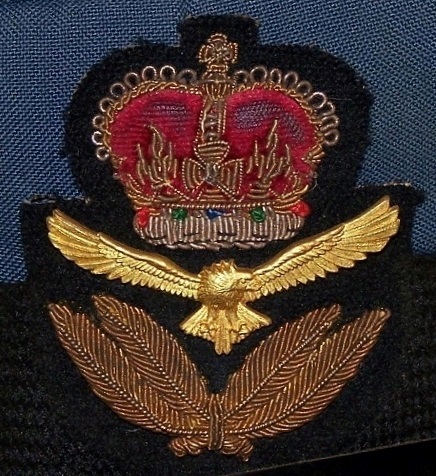 An Air Rank Officer service dress cap with a gold bullion air rank officers cap badge named to Rogers. 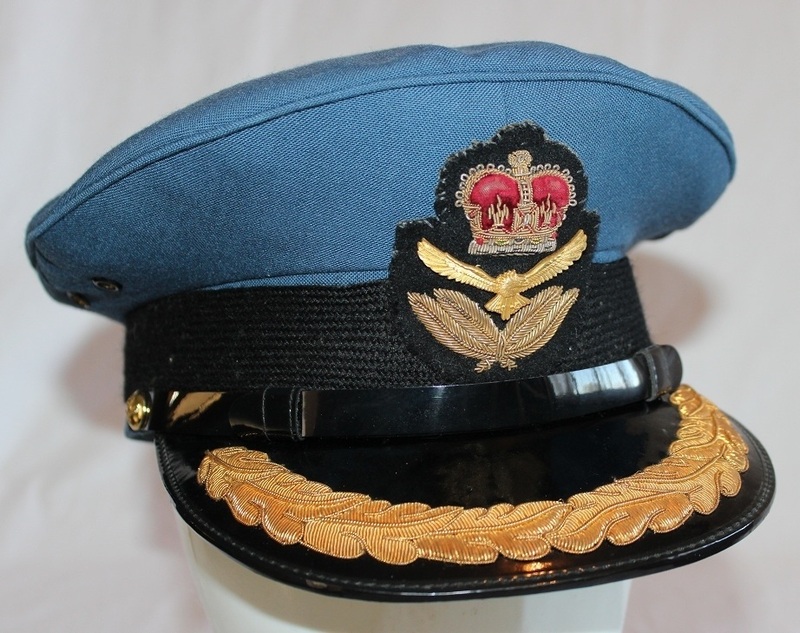 The cap is lined with a blue/grey material and is covered with thin plastic which is then covered with RAAF stickers and COBSRIC. The sweatband is foam backed vinyl and has Rogers written under it, the hat band is black mohair and the vinyl chinstrap is held in place by 2 gold plastic RAAF buttons. The black peak has 2 rows of gold embroidered laurel and the underside is green. H058. 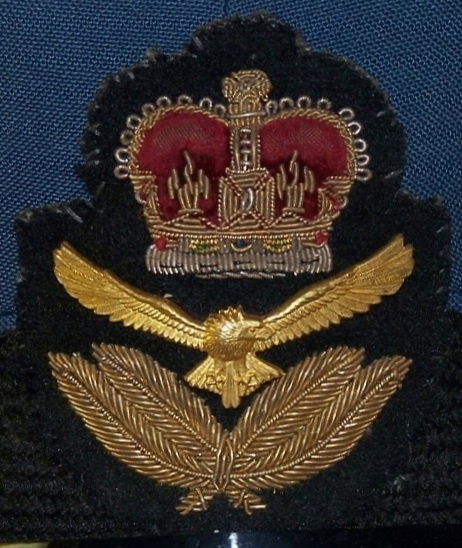 A gold bullion air rank officer's cap badge. H058. Blue/grey liner with souvenir decals. H061. 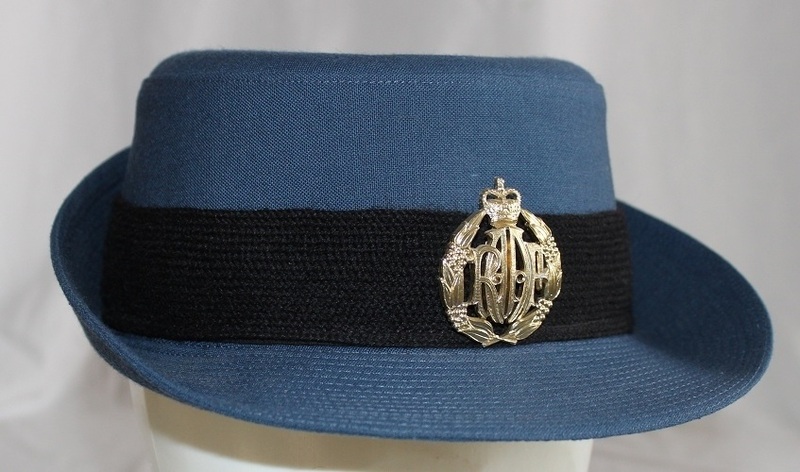 An unnamed women’s (WRAAF) service dress ranks cap with an anodised ranks cap badge. 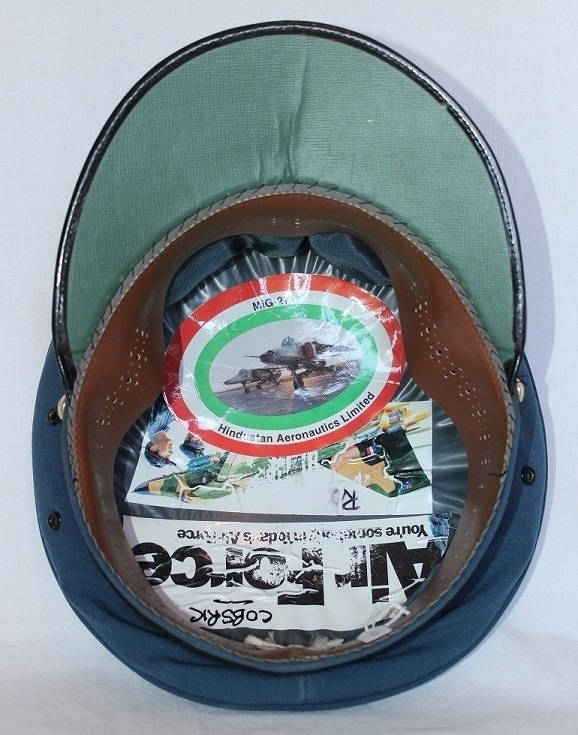 The cap is lined with a blue/grey material and has a white label sewn to the back that reads, Emerco Victoria, arrow, 1989, stock number, size 56. H061. 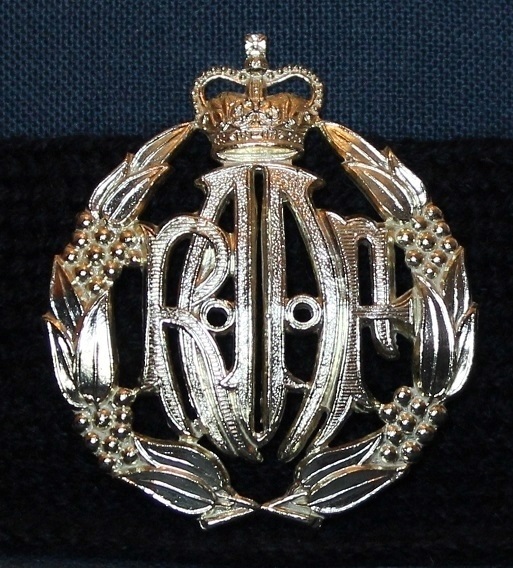 An anodised ranks cap badge. H061. 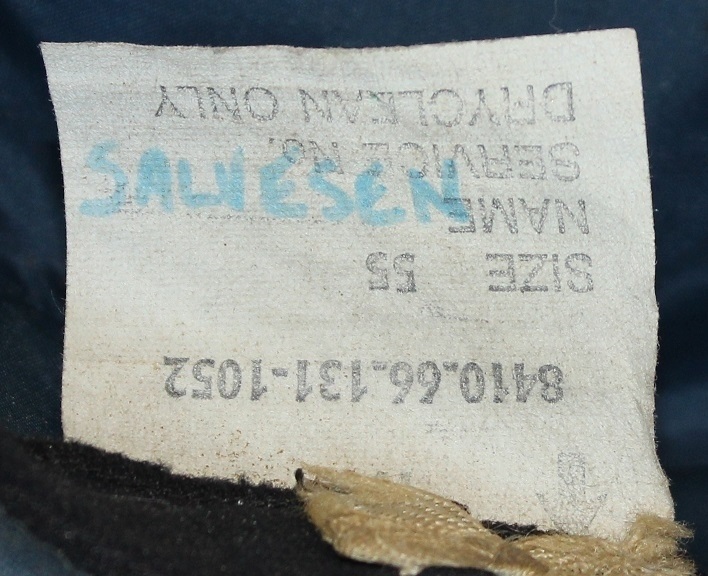 Cloth label to rear of hat. H070. 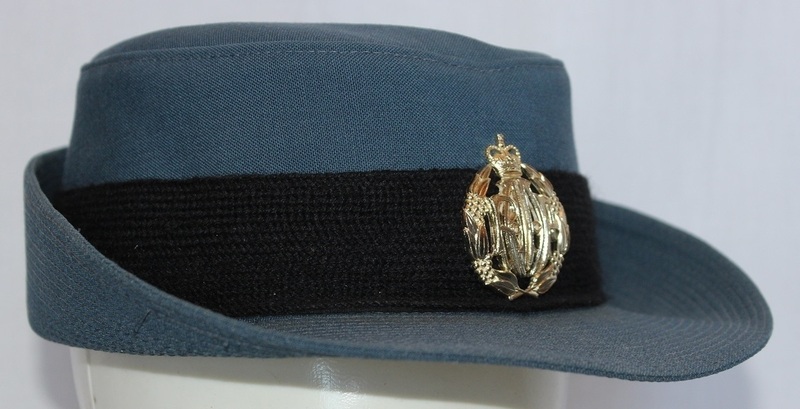 A women’s (WRAAF) service dress ranks cap named to Salvesen with an anodised ranks cap badge. 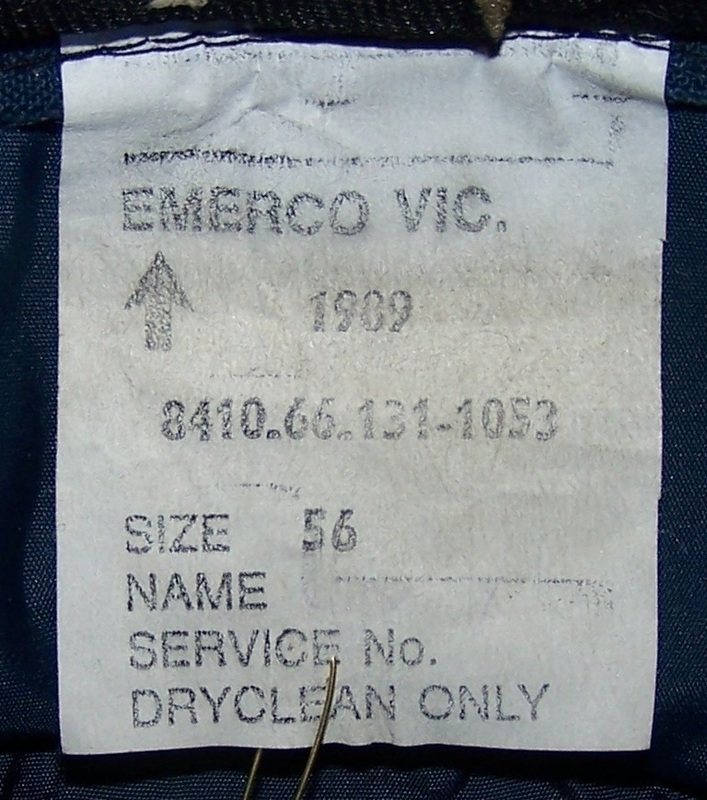 The cap is lined with a blue/grey material and has a white label sewn to the back that reads, Emerco Victoria arrow, 1989, stock number, size 55. H070. An anodised ranks cap badge. H070. Cloth label to rear of hat. H080. 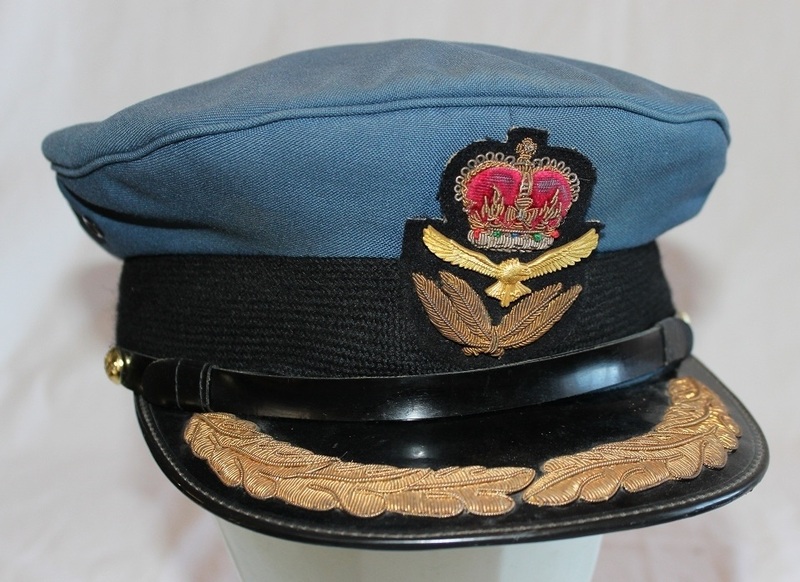 A Group Captains service dress cap named to Funnell with a gold bullion officers cap badge. 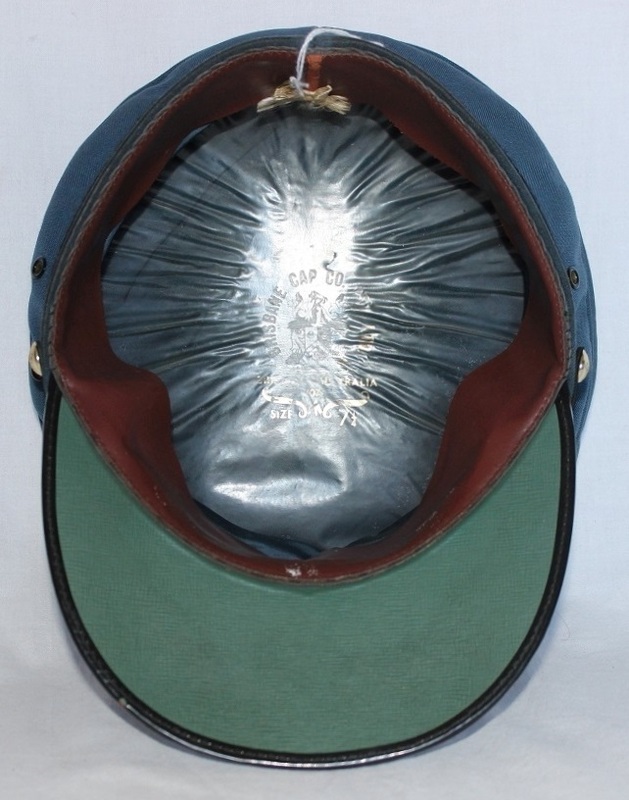 The cap is lined with a blue/grey material and is covered with thin plastic which has a label underneath stamped Brisbane Cap Co Pty Ltd Brisbane Australia 1975 size arrow 7 1/4. The sweatband is foam backed vinyl, the hat band is black mohair and the vinyl chinstrap is held in place by 2 gold plastic RAAF buttons. The black peak has 1 row of gold embroidered laurel and the underside is green. H080. 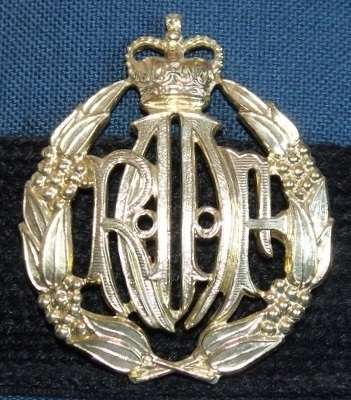 A gold bullion officer's cap badge. H080. 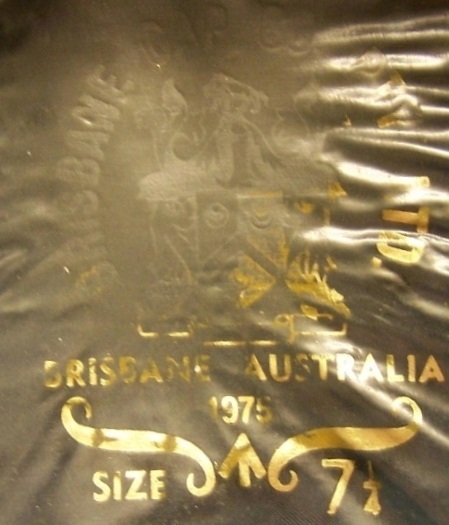 Gold embossed label on liner. H080. Name "Funnell" written under sweatband.